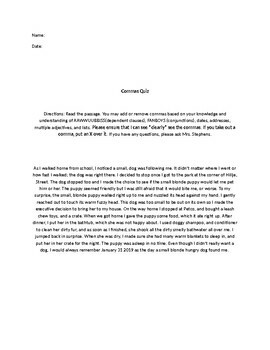 This is a short quiz where students need to insert the appropriate commas using a variety of comma usage rules. You can assess students on using commas with independent and dependent clauses, conjunctions (FANBOYS), multiple adjectives, series and lists. Students should add in appropriate commas and also remove unnecessary ones.